Fox Hollies Park – In 1929 Birmingham City Parks Department acquired Fox Hollies Park, some 40 acres of beautiful park land which was valued then at £250. Winding through the middle of the park is Westley Brook, on which once stood Broomhall Mill, one of a string of mills that ran through the area. A main feature of the park is the large pool, which boasts a great variety of fish. There are some small wooded areas throughout the park, enhanced in 1989 by the planting of some 3,000 trees. 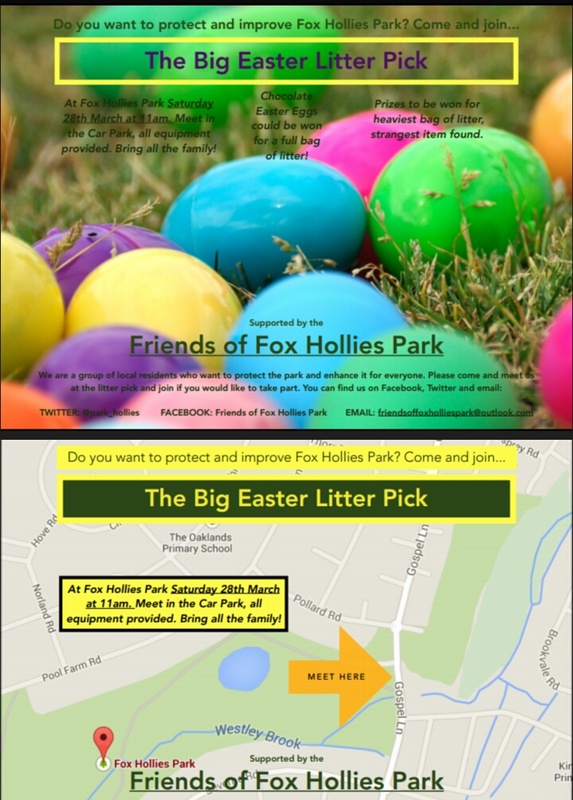 This entry was posted in Events and tagged Acocks Green, community clean up, community spirit, Easter eggs, exercise, family event, Fox Hollies Park, litter pick. Bookmark the permalink.